Why are customers leaving your Website? If you are watching your Google Analytics, you can tell how long your customers are staying on your Web pages and reading the information. If your “Bounce Rate” is high, your customers are not sticking around long enough to purchase your products and services. 1. Look at your content. When visitors arrive at your Website, what do they see? Are you telling them in a few seconds the benefits you offer and what’s in it for them? If not, rewrite your copy. And in the process, think about the action you want them to take. Once they read your home page content, what would you like them to do next? Add a link to the next page you want them to visit. Make it easy for them to follow your content and stay on your Website. 2. Add landing pages for each item. Do you have a landing page for each product or service that you sell? If not, you need to create a page specifically for each item. This goes back to talking about one message per Web page and making things simple for your site visitors. On each page of your site, focus on one particular product or service. This way, you can help your customers see exactly what you have to offer and outline all of the benefits of each, individual thing that you sell or give away for free. Plus, by having a landing page for each item, you can easily check your Google Analytics to see what your customers like most and which landing pages are working  or not. To get the best results from your Website, it’s essential to check your analytics regularly to see what content site visitors are viewing most, if potential customers are clicking on the links you want them to click on, and if your landing pages are doing the best they possibly can. By constantly testing and updating your content to give site visitors what they want, they will stay on your site longer. Plus, if they know you update your content regularly, they will be more likely to return to your site. When visitors arrive at your site, they want their questions answered immediately. Review your site with the customers’ needs and wants in mind. Check your analytics to see what people are clicking on most. This will tell you what they find most interesting and which of your pages are working best. Then, take this information and write similar content. Focus on benefits and a single message on each page. And at the end of each page, provide a simple link to the next step you want visitors to take. Make it easy for them to see what’s in it for them and to press the “buy” button. 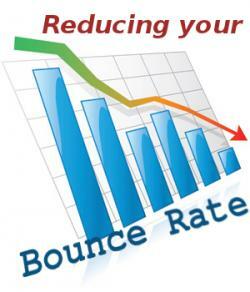 Reducing your bounce rate is all about giving your customers the content they want quickly and easily. Review your site and update your content regularly. This way, you’ll learn more about your customers and be able to give them exactly what they want. Then, your bounce rate will go down, and your sales will go up!